The "Take It!" 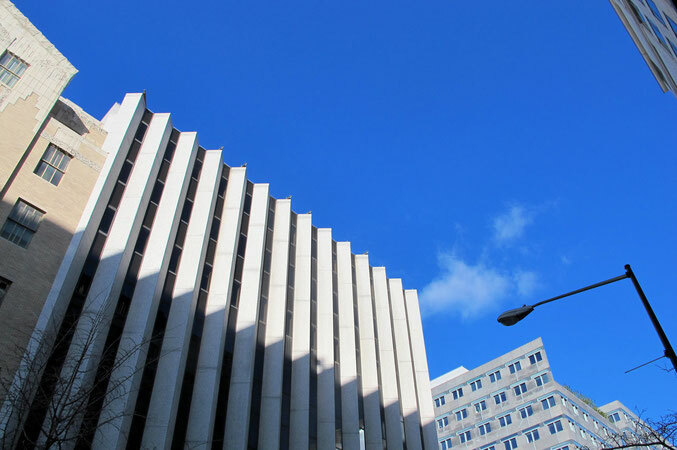 came from looking up at the intensely blue sky matched up with the ruffled edge of this very white building which offered such great contrast. That the upright surface of the white building was shade split added a bit of attraction to the setting. There are several pleasing angles in this shot which caught my eye. The After Take: This photo was the final result of about 5 shots. For some reason it just seemed to be a right capture of a splendid morning. It is a rare photo in that I did not shop it, so to speak. Here is hoping you have some splendid mornings that finds you taking in whatever it might be, that somehow strikes you, as this did me, on how great it is to be alive. The blueness of that sky is intense. The shadow looks like a serrated blade to me. The sky! Wow! So great. It is indeed great to be alive. Cool angles there.